Tempest Shadow, former lieutenant to the Storm King has begun to see the error of her ways since the battle against her previous commander, and now resides in Princess Twilight’s castle. Feeling the need to find her place in Equestria, Tempest leaves Ponyville behind without any festivities. Travelling across the country, Tempest inevitably ends up in the Crystal Empire and in front of Princess Cadence. Tempest is tasked with travelling to the outskirts of the Kingdom, to uncover who or what has been causing so much property damage to the ponies that reside there. Tempest is an outstanding character, and one that was a huge highlight for me in the My Little Pony movie. Seeing how she has changed from a carefree young filly to a ruthless warrior, after the loss of her horn, is remarkable. In this story we see this all being replayed again, as Tempest comes face to face with her past: one of her childhood friends – Glitter Drops! Tempest is a very different pony now from when she last saw Glitter Drops. Will their short time together heal old wounds and mend broken friendships? Or is Tempest about to lose more than just her horn? Going by what happened in the movie, action and adventure follows Tempest at every turn in her life. This is not always for the benefit of every pony and creature, but she certainly is more than capable of looking out for herself. Having dedicated the majority of her time since getting badly hurt by an Ursa Minor to looking for some possible way to repair her horn, Tempest is sadly let down once more at the end of the film. Now, since leaving Twilight’s castle, she has journeyed across Equestria in hopes of finding a place to belong. Coming to terms with her past and hatred is only step one; there is plenty more to come for this story in issue #68. 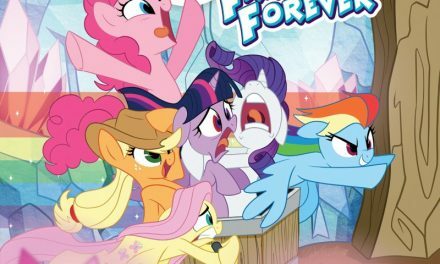 Andy Price is a veteran in the My Little Pony team over at IDW Publishing, having created the vast majority of the comic artwork and helping to bring the stories alive. This issue is no different! Issue #67 has three variant covers, with cover A, pictured at the top of this review, by Andy Price himself. This shows Tempest towering above Princess Cadence. Although not shown in the best of light, she still appears as a villain on this cover. The same artwork and style is continued in the rest of the issue. Cover B is by Sara Richard, which is the second image pictured in this review, with dreamlike colouring and pencil-styled artwork. The more adult Tempest looks down on her younger self as she runs away from her two friends, starting her journey of covering her hurt and masking her pain. On a brighter note, we have the cover RI from Naomi Franquiz, with the Mane Six enjoying some tea in the garden. Nothing to actually do with the story, but that is what the cover RI artwork is usually about! This has actually been the most enjoyable issue in some time for me. Tempest is still a new character in the MLP universe and one that I have really been looking forward to learning more about. With some intense backstory and major character building along the way, its time for Tempest to strip back her layers of bravado and cold exterior, accept what has happened to her and see if she can revert back to the young, cheerful filly she once was. You can buy this issue now, both online and in your local comic book shop, from IDW Publishing. There is a lot more on the way in issue #68!